Bundi Haveli, a heritage property in the heart of the old city famous for it’s backdrop, the Garh Palace and the Taragarh Fort. Recently restored, this elegant new boutique hotel offers 12 rooms from standard to deluxe, all rooms have attached bathrooms with modern fixtures. Rooms feature window seats (jharokhas) offering stunning views of the old town, palace, fort and lake. 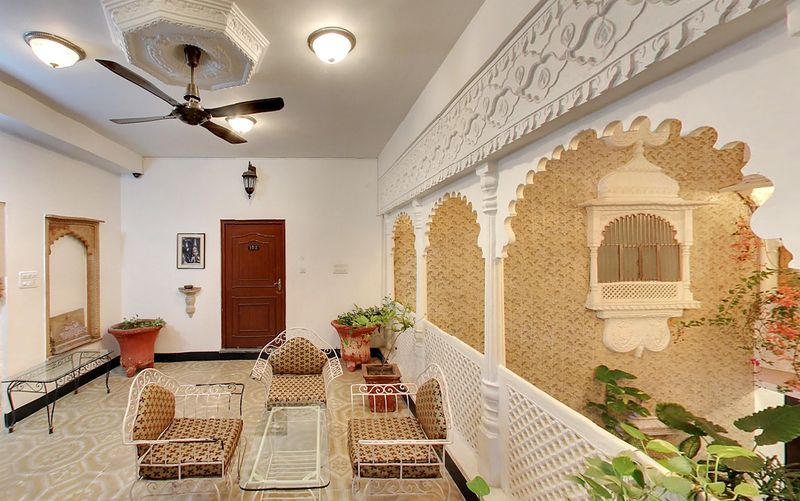 A courtyard garden restaurant in which to savour traditional Indian and Continental cuisine. The restaurant features beautifully carved stone pillars and jali windows, crafted by local artisans along with artwork featuring Bundi. A rooftop terrace offers 360 degree views of the town and is a wonderful place to sit and hangout and watch the sunset over the hills surrounding the town. A perfect destination for a romantic holiday.